Theatre 68 presents the world premiere of a new play, Irving’s Tiara, by director/writer Sam Henry Kass, former executive consultant for the TV show Seinfeld. 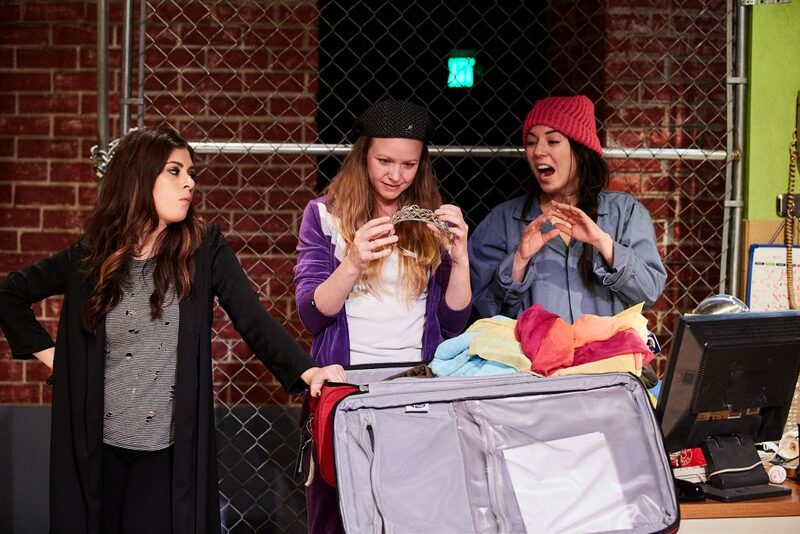 Three women plan to steal a tiara in this dark comedy set in New York. The accents are heavy and the humor shocking, while the extreme dialogue is jammed with pop culture references. Theresa Ireland plays Lydia the mastermind behind the heist and running what appears to be a recreation center. The entire play takes place in its office and locker room. Lydia harbors racial biases towards everyone from Jews to blacks, and frequently scorns her female employee Tommy’s love life and her intelligence level. Lydia’s biting, sarcastic remarks form a contrast with Tommy’s graphic sexual openness and social liberalism. Tommy, played by Jacqueline Misaye, follows Lydia’s orders, though not without lobbing some witty ripostes. 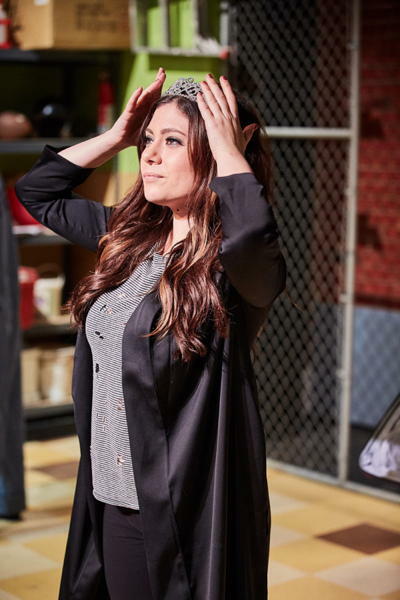 Enter Rachel, played by Brittany Rizzo. She’s Tommy’s sister, and acts as a counterpoint to Tommy’s wild side. She also serves as a voice of attempted reason, countering Lydia’s extreme prejudices and Tommy’s liberal values. Glued to her cell phone and employed as a Retirement Center next door, Rachel adds to the conflict. This play may be offensive to people who are of Jewish faith and perhaps those who love Obama care, however the ending turns the beginning on its head. Ultimately Irving’s Tiara is a stark look at the realities of those struggling to get by and who have lost sight of right from wrong. The gender of the characters, and their candor about topics more typically heard bandied around a male locker room, sets Kass’ play apart. Laced with soliloquies (though no doubt overheard by the other characters in the room), the show makes fun of everything from sports star Michael Phelps, to (chairman of Hillary Clinton’s recent presidential campaign) John Podesta, while offering social commentary on the plight of the homeless and what Lydia calls the “Circle of Life.” One learns that “society has limited [their] opportunities,” leading to the tragedy within the comedy. Warning—this outspoken play is not for the under-aged or overly sensitive. It leaves one wondering who the writer meant to offend as nothing is sacred. Thursday and Friday, 8 p.m. Final two performances Tuesday February 28 and March 1, 8 p.m.
Running time: Approximately eighty minutes, with no intermission. Purchase Tickets here or call (323) 960-5068 more information can be found on Theatre 68’s website.